On March 11 2016 at 4:44PM an order was placed at store #1761. I purchased several items totaling $20.07. The order number is 534. My card ending with 3659 was used to make payment along with cash. However, the employee incorrectly inputted the transaction wrongly. The individual apologized and got the assistance of the manager. He corrected the matter in regards to the mechanical error, then he apologized. Afterwards, he informed me that I should receive credit on my account. He told me to check my account to see if the amount was put back, to date it has not. Fyi: I attempted to use the site listed on the receipt, it did not have the codes at the bottom and would not permit me to move forward. It says, Check Closed. Duplicate receipt. While I have felt Burger King was the best fast food restaurant for many years, I have to tell you that I had my first and last experience with your chicken fries. Absolutely terrible. I have since talked to others who tell me they did not get past the second piece. I got to the third because I couldn't believe how bad it was. I suggest you remove it from the menu. By the way, the french fries I received with my order were the best. I would give the chicken fries no stars. I specifically ordered 4 egg, cheese and hash brown and it had sausage on it. I do not eat pork and it made my head hurt so bad. I spit out the one bite and it stiill made me sick. I was clear in my order and it was still wrong. I was offered another but was turned off at that time. I went to Burger King, got a whopper and a apple pie in Gary, Indiana. When i got home and ate my sandwich I went to eat the pie. It was all moldy and made me throw up my dinner. I will never eat at that restaurant again. On 2/11 @1:30 pm I went thru the drive thru @ BK4390 potters rd. Matthews NC Tried your new long fish meal. HORRIBLE It was luke warm and "funny" tasting. After 3 bites I bit down on what seemed like a stone. It was the size of a small pea. Knowing I would not eat the rest, I mashed the fish with a fork and found 2 more "stones" a little bigger than the first one. What have you done to my BK? A side line- the French fries (ordered well done) where pale and not even warm. AWFUL. Glad I didn't chip a tooth. I have the "stones" IF you're even interested. I went to the drive up window around 12:15 on Sunday Jan. 24th. I was asked to pull up and they would bring it out to me. I waited 10 minutes and went inside. They had bags made up, sitting there getting cold. I tried to get the woman behind the registers attention but she ignored me. I waited another few minutes and a young man finally got around to bring the food out. Everything was cold by then. I wouldn't give my experience even one star. You need to have a minus star on there to. These are the people that think their work is worth $15. Sorry no it isn't. On 1--2-16 I went to the Hartland burger king. Ordered two frozen coke floats. Susie snootily replied. We don't make them anymore. I ask if she could just put ice cream in a frozen coke and charged me for both. Loudly and snotty she replied. I told you once we don't make them anymore. I said every other Burger King does cant you and her reply was worse then her last one was. I finally told her just give me two cokes and two ice creams and I'll do it myself. We came up to the window and another lady apologized saying it wasn't me that talked to you that way and she's being transferred tomorrow thank gosh. I will never go back to that store And will let everyone I know know that you get treated terrible at that store and not to go there. Very disappointed, first service was slow and then getting back to my office this was the order of fries I received with my order. The location I visited was at 1094 North Main street, East Peoria IL 61611. Host who bagged this order was Jessica, after having to tell her the order was to go. Ticket stated To go! Now it is time to complete the process and email customer support this photo too so the executives at BK can see how the other half lives. 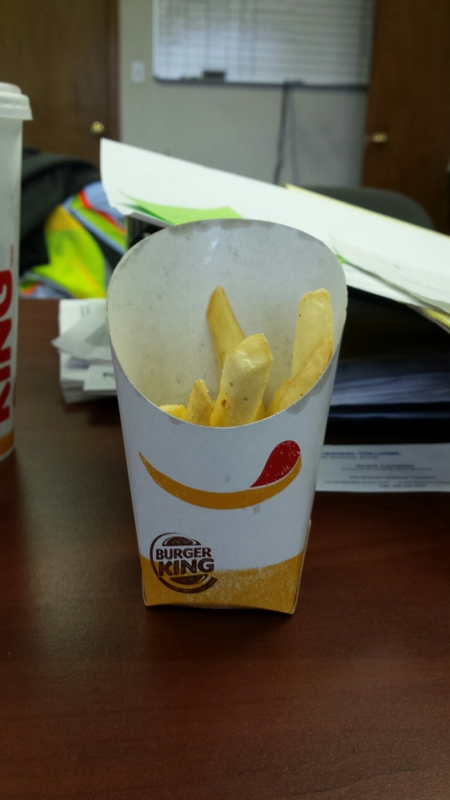 On October 31, 2015 at around 10:15 pm, we had a bad experience at Burger King drive-thru located at 1721 Belvedeer Rd. West Palm Beach, FL 33406. (I was buying this meal for my wife. She was siting in the car with me). I drove thru the dive-thru and asked for a Whopper with Cheese meal, with no salt on the fries and a strawberry milkshake, with "no cream on the shake". The lady that took our order was very unprofessional and rude. She answered back in a mean and loud voice..."WE DON'T PUT ANY CREAM ON THE MILKSHAKE". My wife answered back "THANK YOU"! Every time my wife asks for a milkshake, she tells them "No cream on the shake". This is the first time someone get upset because we asked "no cream on the shake". I was also asking for "no salt on the fires" but apparently the lady turned-off the speaker. I repeated this several times until finally she answered and I told her that she was very rude and I drove up to the 1st window. I asked for the manager and she replied "I am the manager". I asked for her name and said "Vilma" . I told her that I was going to complain about this and that she should not be working with the public. 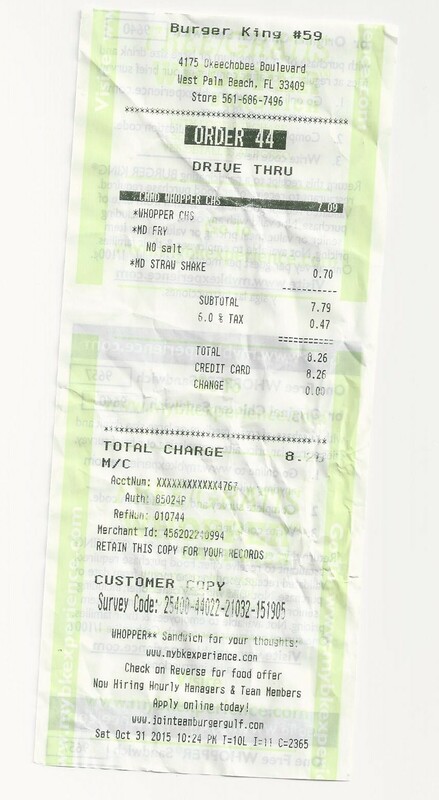 We then drove to the Burger King located at 4175 Okeechobee Boulevard, West Palm Beach, FL 33409 (See attached receipt). I asked for the same thing and to make sure, my wife said "no cream on the shake". The lady said "OK". We got out meal and drove back to the house. I stopped off at Burger King in Key Largo, Florida with my sister and nephew on my way home from shopping in Florida City. I do not know if this location is lacking a manager, but it was the most disgusting Burger King that I have had the misfortune of walking into. The trash was spilling over everywhere. Over by the drinks dispenser was a mess. A large majority of the tables had not been cleaned either. Needless to say we did not hang around to buy our food there and a couple behind us obviously felt the same because they walked out as well. I wish in hindsight now that I had taken a photo, but all I wanted to do at that moment was get as far away as possible from this hell hole. On my way home I stopped in at Burger King located at 1290 W. Normantown Rd., Romeoville, Il 60446 around 8:10 pm. I did order 2 whoppers with cheese and I was very clear to the girl only ketchup on the burger and a large fries. I did look at the monitor and everything looked ok so far. When I got home like 30 minutes after after a long day of driving, I called my son to come to the kitchen and eat and when he started eating and found out that the Whoppers had everything on it. He got upset right away. and he did not eat. I tried like 40 times to call Burger King at 815-886-1229 and the complaint line was no help. I gave up. I am very upset, because this is not the first time that happened. We like the Whoppers, but I will never stop at a burger kind again due to this horrible customer service. It's just plain bad. Went to Burger King #4547 this morning in Moraine, Ohio to get my breakfast to take to work with me. Sat down at my desk to egg my Sausage egg and cheese sandwich and they gave me the wrong sandwich. They gave me ham and I hate it. Help need to pay closer attention to what they are doing. Lesson learned for me to go back to checking my order. This is not the first time this has happened and this is not the only complaint. I went to Burger King on Wednesday evening at around 6:30pm. I ordered two double whoppers with no cheese, onion rings and fries. After placing my order they wanted to give me the onion rings and the fries that had been sitting there for who's knows how long. I told them i wanted fresh ones which they did. When i got home both my Whoppers were only single Whoppers and when I called the manager said she would replace the order which is fine but how many times do I have to go there to get the right order. It cost me gas, travel time, my time, aggravation and why should I put myself out to do something that should have been done correctly in the first place. When I went in there were no other customers so that wasn't the issue. what I am thinking the workers were there looking at their cell phones and shooting the crap not paying attention to what they were doing. this is why I hate All fast food restaurants is because they can't get an order right and they want more money. There must be a bunch of lead heads working at these places. This happens quite a bit at these places. My husband and I went through the drive-thru in Sheridan, Arkansas on 29 October, 2015. It was a freakin disaster! EXTREMELY slow and the girl had me repeating the order numerous times...really? I am a teacher and I know I was speaking clearly and loud enough! ONCE the order was correct on the screen, I drove around to find that my order was $21.45....WHAT...I order a Whopper, Fish sandwich, 2 large fries and a large sweet tea (my husband had his drink in the car). I tried questioning and the attendant said that my receipt would be on the bag! When I finally did get the order...of course...it was wrong! People go through the drive-thru either because they are in a hurry or just lazy...regardless of the reason...the customer should not have to wage a freakin war to get food they are paying for! Burger King...you just lost a customer! Stopped in at your store about a month ago for breakfast, so looking forward to it. I always order the ham and cheese croissant, my favorite. Well that store was out of ham. I ate nothing but did sit and watch my husband eat. This particular store shares the parking lot with Walmart, I pointed out to the cashier perhaps they should go and purchase some ham from the Walmart store. This just went right over the cashiers head. As I was leaving hungry I stopped at the counter and asked to see the manager, Amanda was the manager, I asked if I could have the corporate office phone number and Amanda stated "we don't have a corporate office". I said you have to have a corporate office. Nope she said. Needless to say this was just plain stupid. My own opinion is that you should maybe hire smarter people and/ or train your managers to include the number for the corporate office and put into place a back up plan to buy ham elsewhere. My experience at that particular store was a minus 5. The burger King on E Mullan in Post Falls, ID. The order was wrong and the staff rude, and ordered a large fry, and came only half full. No apologies, nothing. They said they were busy, but that is not an excuse. Also, every time we have gone their coke ice machine is not working. I bought my food from burger king and as I proceeded through the drive through I noticed that my fries weren't in the bag. Not only that but there was mold on the lining of the drive through window.was old. When I mentioned it to the staff they shut me down and said that the restaurant was old. I then noticed that my drink cup had ants dead and alive on it. So I checked the inside of the fruit punch I was drinking and saw that there were ants on the inside also. that in itself was enough to make me want them shut down. I will never go here again. On 7/1/2015 at 9:15 pm I went to the Burger King on 1117 Central ave, in Summerville SC. I drove up to the restaurant and there was an employee outside and I asked him (a male about 5'10", white with a mustache and wearing glasses) what time the dining room closed and he said it was already closed and that I would have to go thru the drive thru. I pulled my car around to the drive thru and after about 15 min I got my order and I asked the female employee working at the drive thru (white with long dark hair) what time the dining room closed. She said she did not know and then looked at the clock and said now and it was 9:30 pm. I feel like one I was lied to by the employees in the front because he said the dining room was closed, and she first said she did not know when the dining room closed and two she just looked at the clock and said now. I feel this needs to be addressed by the management at that store that Burger King is being represented this way. I think it's sad that Burger King charges over $2 for a large cup of ice. The cup can't cost more than 30 cents and how much could ice possible cost. It's summer time and it's very hot in Mississippi. I can go to McDonalds and get a large cup of ice for 50 cents and that's where I'll be going from now on along with all my friends & family. We won't be back there ever again. Went to burger king on highway 6 and beechnut 8404 highway 6 south Houston tx the employee female was rude to me refused to serve ne spit in my fiod and ask me not to come to burgerjing again. Sge slamed the window. At me, I asked for her name she refused to tell me yelling and screening at me. I complained to the manager he did nothing. It happened today 6-12-15 at 3:54pm. This is not the first time said emploee is doibg such to me. My wife and I ordered 2 whoppers w/ fries and onion rings. They switched the buns (turtle shell type) without informing us. The franchise is in Fortuna Calif. The burgers were greasy and tasted terrible. The onion rings and fries tasted like rancid oil. I have always been a patron of Burger King vs. McDonald's. I asked for a refund, was told i could apply it to another order. I do not like this franchise. I will never eat at a burger king again. I will never recommend burger king to anyone, and i will tell them how bad it was.. The wifi at the Phoenixville pa store has not worked in over two weeks. I was a frequent patron, but now I go to McDonalds. I will not return until I am assured that Burger King in Phoenixville pa has a working wifi. I made a complaint about the Burger King in Ellwood City, Pa just a few weeks ago and today I received a coupon for a free whopper. I just went to use the coupon and they wanted to charge me tax. I think that is absolutely ridiculous! There is NO WAY anyone can charge tax on something that is free! 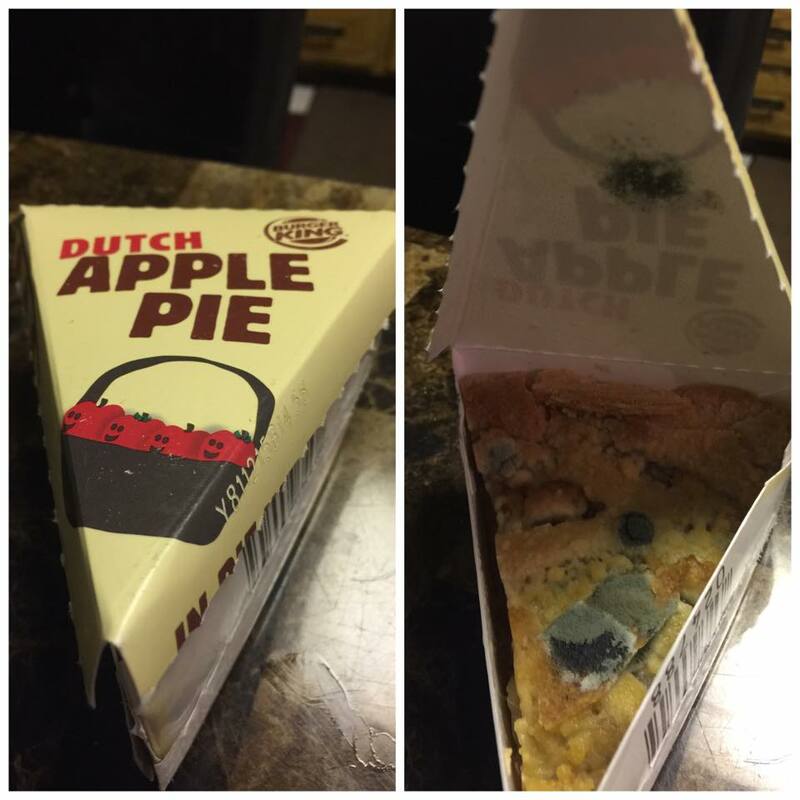 I definitely will NOT be ordering anything from Burger King again! This has been nothing but a hassle. These people are extremely rude and they should not be working in public if they are going to be so ignorant. I do not understand why coupons are sent out for "free" whoppers to make up for the previous incident when they are trying to charge me. Ordered my food at the drive through window at the Grand Rapids, Mich. at the Plainfield Ave and Cannonsburg Road location. I ordered two woppers, 2 vanilla shakes and 1 water. I told them I had a coupon for buy one get one free. I got to the window, got my woppers and the water drove out. I realized I had forgotten the shakes, got back In the drive through line, ordered 2 chocolate chip cookies for a dollar, drove up to the window again said.... you forgot my vanilla shakes, and handed her the receipt. Her response was can I please have a dollar 6 I gave her the dollar 6, she rudely hands me one shake, then says here's the other one. I was very offended by her attitude. No "I'm sorry" or any thing. I momentarily paused in the drive through line and looked at her wanting to say something to her but I held back. She looked out the drive through window and said sarcastically "do you need anything else?" I responded, "No" rather perturbed. Then she sarcastically waved her hand at me and said "Ok Good Bye." This is not accepable behavior for someone who deals with customers on a daily basis If I were her manager. I would give her some well needed training or possibly the manager could use some also. I almost went back to that location and confronted the manager about it but decided to vent this way may be more productive. I am going to mention this to anyone who asks me about Burger King. If the subject ever arises. I am discusted . The whopper has always been my favorite sandwich for over 20 yrs. I often stop at Burger King, #11248, after shopping in the area. BK is located on Zeeb road near Ann Arbor, Mi. Recently, I have noticed staff problems, often no cashier and a constant change in employees. Today I stopped at noon. There was a long delay in taking my order, no cashier and a long line of cars waiting for their orders. When I finally got to the pick-up window, I paid for my whopper. There seemed to be a lot of confusion inside and after 20 minutes, I just left. I think you need a new manager there. I'm sure you are losing a lot of customers there. I usually never complain about this type of thing but it was my favorite restaurant. I will have to drive into downtown Ann Arbor for my whopper from now on. I have visited the new Burger King in South Holland and it is very nice, but the service is terrible! I was in their on 5/7/15 and ordered two whoppers and two fries and it took over thirty minutes to get my order and their was only two other people in the whole restaurant. I love Burger King and was happy when they built the one in South Holland because I live their. I eat at other Burger Kings all the time but this one is the worst when it comes to service. I find it sad that they would build such a beautiful restaurant and not monitor the service. Those people who were working that evening acted like they just did not care about the customers. This has happened to me both times that I went in there. I hope this complaint makes it to the right person because it is such a nice facility but needs management attention badly. After my son's baseball game, we went to Burger King in Nevada, MO. It was a horrible experience. It took 24 minutes to get our food, 5 people walked out, and they quit taking orders for over 10 minutes! When our food finally came out without the frozen treats, I brought it to the managers attention the time on my receipt, and how long we had been waiting. He yelled at me saying they had done over $2,000 dollars in sales with 5 people and that is just the way it goes. Our team will be going somewhere else during tournament times. My Mother and I ate at a store in Kernersville NC today, Sunday May 3rd around 12:00 noon. I don't know the store number, I just didn't want to even talk to the manager at all. There was a family in front of us and we waited patiently before our order was taken. When we were ready to have our order taken, we gave the lady at the register a coupon. She took off the one sandwich that was free, with a buy on get one free coupon. Upon waiting for our order, people behind us kept piling in. We waited and waited and waited. My Mother has a very bad back so she went and sat down. Our food was kept in the warming bin for a few minutes then put on a tray. The manager on duty was waiting on all sort of food from the grill area. We waited almost 20 minutes before we got our food. By the time we got it, it was cold. It sat on a tray for over 5 minutes. dirty floors, dirty around the drink fountain, and dirty tables. The food was not hot. This store was in Canton, Ga. It was around 9 at night and it should be cleaner that that. I was very disappointed since I had eaten at the one in Acworth, ga the day before, and it was delicious and the food was hot and it was clean there. Ordered my food, paid and was told (we will get that for you as soon as we can). I was waiting for my food when I looked up and saw the manager pick up a tray of food off the counter and put it back in the warmer. I walked up and ask if that was my food. She answered yes that my name was called by one of the girls. I responded no ma'am I was waiting and listening for my name and it was not called. She raised her voice and started to argue with me that yes she did. I am positive my name was not called. This was at 994 high st Wadsworth, Ohio. 4/10/15 at 4:59 pm. I went through the drive through as I do each morning at 7:22 AM. The young lady that took my debit card swiped it then laid it face up, numbers exposed on the register while she went to make my coffee. I immediately called out to the girl to give me my card back. She tilted her head as to acknowledge my sounds but then ignored me, when she turned to give me my coffee I asked if she did not hear me. She then looked at me with a disgusted look and closed the window in my face. In todays climate with cameras and all sorts of tricks it is very dangerous to leave your card exposed. All the other times after the card is swiped they give it directly back to me. Not this girl. I did get a chance to speak with the manager, she did apologize but the issue is not with the manager, it's with the young lady that served me and possibly the training Burger King gives it' employees, both about how to handle cards, and secondly how to provide a paid for service. Several weeks ago, I was at a meeting listening to several women talk about their favorite take out restaurant. Several of them stated that they would not go to Burger King anymore because it was so dirty and the dining room was seriously neglected. I disregarded the comments, as my husband and I enjoy a whopper and a senior coffee there occasionally, but had not been in for a little while. Several days later we decided to go for a hamburger and ended up at Burger King in Post Falls, Idaho on Mullen Ave.( where we live). Entering the store, I noticed that the windows were very dirty,( first thing your customer sees and should be kept sparkling). We sat down at the table with a game machine, and proceeded to look it over for a game to play. It was so dirty, food in the crevices and screens were obscene. I asked for a bar towel to wash the machine, but the clerk was kind enough to come and wash it for me. I noticed that the windows were dirty, and the sills were dirty along with the chairs, floors walls. I used to work in fast food, and if our store was this dirty, we would have been fired. The next day I decided to stop by to get a senior coffee at the drive up window, and it was also disgusting along with the ledge in front of it. The clerk said she would take care of it. Yesterday we went to Spokane Valley, Washington, and stopped at a Burger King there. I used the bathroom, and it was terrible and obviously not cleaned recently. The counters, floors etc were also just as dirty as the ones at the store in Post Falls. I know you are thinking that it could be attributed to rush hour, but what I was noticing was not just recent occurrences. We would hate to give up our habit of selecting Burger King for our take out, but if something doesn't improve, it will happen. On 4/6/2015 at 9 am i was traveling for business and stopped at your store off exit 76(10385 N us 31). I was craving a burger,and im so glad you offer them early. I pulled into the drive thru ordered a double whopper meal, took a little while but I understand that.My food came out, I drove off ready to pull out onto 13 north, I opened the bag to find 2 tater tots,2 breakfast sandwiches. I was running late and almost went on, but as I said, I was really craving a burger,so I turned around. I waited through the drive thru again. The girl gave me a new bag, and told me to keep the other. I said what am I going to do with that,and she replied she cant take it back.I argued the point and told her to throw it away then, she reluctantly took it.I get back out on the interstate,and I don't know how, but I get hot fries, and a cold burger! On Monday 6th April at about 4pm my husband, I and my three children went to bk in cowley retail park. We were waiting in the quee at the tills when the man in front if us raised his voice to the girl serving, he was telling her that he spoke her language and what she said was very rude and she should think about what she said before she spoke. I took my children to find a seat leaving my husband to order. While waiting the man who spoke to the girl serving told my husband that the girl had told a co worker that I was fat. This lead to my husband having a word with the manager after he had spoke to my husband and I and said he would talk to the girl. He apologised and nothing else was said or done. I'm very disappointed as what was ment to be a treat for the children turned into an uncomfortable meal. 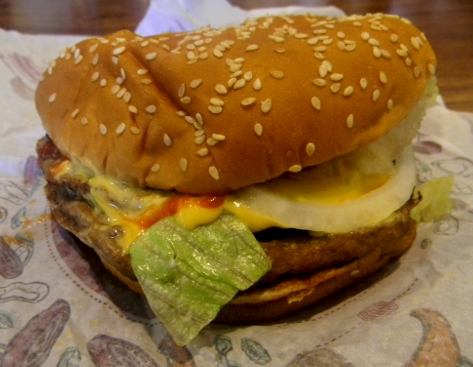 I ordered a Whopper, Jr. meal with cheese. (this is a complaint against whoever made the sandwich, not the guy who took my order.) when I got home, there wasn't any cheese, even though I was charged for it....I put on my own cheese, and while looking at the inside of the sandwich, there was one pickle, one tiny slice of tomato, one tiny ring of an onion and the lettuce you could hardly find. I remade the sandwich, adding my own cheese, pickles, onion and lettuce. I am writing this to you to let you know that two of your BK's that I go to are deliberately having their printers not print the receipt survey number out so that you can't read it, and can't do your survey. They are store #2956, and #7249. This has been going on for at least two months now. I was first told that the printer needed ink. Than a few weeks later I saw an employee at the mall, and when I asked if the printer was fixed, I was told that they don't want us to call in. The reason is because they don't want us to get a free item, and they won't make as much money as they would without the survey receipt. If you send someone to these BK's you will see what I am talking about. I will stop going to these places if they don't fix their printers. Burger king @ 200 East Judge Perez D. Chalmette,la April 1st 815 a.m. Went in to order a breakfast meal. 2 employee 1 for preparing the food the other take the order from drive thru and front countner REALLY. you need to get more employee's or close down that is dam rite STUPID. I ordered chicken fires today for lunch and much to my surprise there was no chicken or very little, what taste there was tasted like fried dough, very little flavor, they were also very dry. they should be dough fries. very disappointed. This Bluefield Va Burger King has not had ice cream for over six weeks and we come for the shakes and Icey floats. Not a good representation for theis store in Bluefield Va. Went thru drive thru after paying was asked to drive up to wait for tens minutes which there was know other customers when i got home old fries so hard you couldnt eat them i ordered a double with cheese i got a single know cheese and burnt bun its really sad yall open for 24 hours and know customers and still I received a bad product! On Wednesday, (3/25/2015) at 11:35 AM, my family, and myself went to one of you drive thru. I brought a spicy whooper ( without cheese), whooper junior with cheese, 9 piece chicken fries, 2 bacon cheese burgers,1 large onion ring, 3 small fries, 1 medium ice coffee, and 1 medium fruit punch. receipt number (217), my complaint is that we found hair on one of the cheese burgers and they did not contain no bacon, my other complaint is that my spicy whooper had cheese on it when I clearly stated no cheese. This is bad business, my son had ate off the cheese burger when he found a long black hair on his burger. I also have a complaint that no one in the store were wearing hairs nets, and they all has long hair. The store number I went to was #03456. Cashier 300169 Britney. Address: 5120 W Capitol Dr, Milwaukee, WI 53216. Addressing the Burger King in Panama City fl on 1396 w. 15 th st 32405 Store phone # 850 784 1660. I went in @4:51pm on 3/25/2015 I ordered a double whopper w/cheese and fries and a chocolate shake. I asked for a senior citizen discount the cashier said we don't do senior discount's I then informed him that yes you do I always get my senior discount. He said he is not allowed to gives discount's yet. He said I would have to speak to the manager I said ok can I speak to her he went and informed her that I would like to speak to her she said ok give her a couple of min so we waited patiently for about five min then I told him to go ahead and ring it ,regularly so other people could get waited on. My order cost $8.49. Then I steped aside to wait on my order and to speak to the manager by now 10+ min 's have passed I watching the young manager working and I waited patiently. Finally she told the young cashier his double whopper was up. Now my order is ready and she still never took a moment to address my concern, I asked him who was her boss and he shrugged his shoulder's saying I don't no , then he told her I wanted to no who her boss was and she never informed me so I proceded to tell her that all I wanted to ask her was about my ,senior discount she said all I had to do was ask him which I said I did and he said I had to ask you. She told me she was busy and if I had a problem with that I could come back there and make burger I told her I'm retired and I have made more burger's in my day than she is old. I have grand kids older than she is and I have paid my time.i told her that she could have answered his ? From where ever she was and never stopped working. My problem is that this little girl would not take time out of her busy day to respect her elder's and it's sad because I'm a customer the reason she is able to be a manager @ Burger King. All this over a senior citizen discount and a very disrespectful manager don't remember her name but she was working @ 4:49 pm on 3/25/2015 the young cashier was new I could tell because he really did not want to upset her by asking her my ?'s . My Host: was William order#219 I really would like for someone to address this issue I and my wife have had this happen to us a few times @ this Burger King five times we get senior discount then when a new employee comes in they don't understand the discount there should be proper notification plastered on the bulletins board for all employee to honor the men and women of the military and seniors who have earned the right . That young lady needs to know that some gave all and all gave some for her to be in the position she is in. I went to burger king in Macon Ga. ask for a chicken sandwich with light mayo ,when I got my sandwich it was fill with mayo,also it taste like it was cook in old oil and had bend under the heat lamp the sandwich was not freash. A manager (Fea) came in yelling at a couple employees telling them to shut the up and putting her hand in their face, also was throwing creamer in one of the employees face. I called Burger king last march 3rd about bolt in the milkshake and they said will send to big corporate office and they never call me. I call every once a week ... and they never call me until now.